There are 7 different select widgets available. 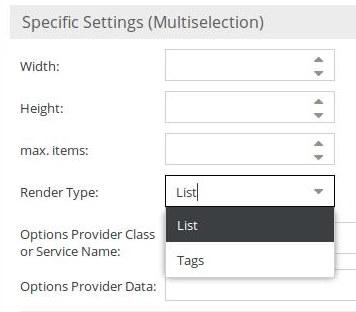 Except the Multiselect widgets, all of them are portrayed by an input field with a drop-down list of options. 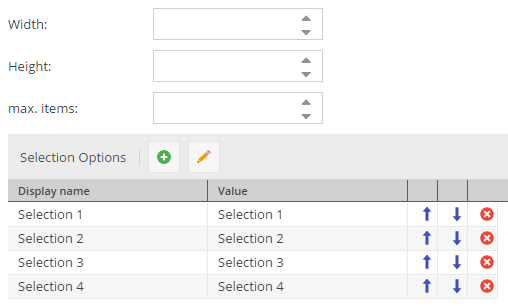 The database column type is VARCHAR for all select data types, TEXT for all multiselection types. The configured value (not the display value!) is stored in the database. In the case of multiselect, values are stored as a comma separated list. Country and language have fixed option values. For the language field the options can be limited to available system languages. 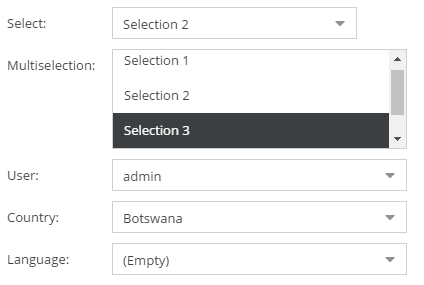 The country and language select field are also available as multi select fields. The user field has fixed values as well. It allows to select a user from all available Pimcore system users. Thereby a system user can be associated an object. In order to set a select field's value programmatically, the value is simply passed to the setter. To set the values of a multiselect field, an array of values is passed to the setter.